TeeJet Spray Equipment FieldPilot is an innovative GPS guidance device that provides effective results in an easy-to-use package at an unbeatable price. Guidance information is provided on a bright, clear graphical display and also on a built-in lightbar. The system will provide manual or automated guidance in parallel (straight) and curved AB patterns. The simplicity and value that make CenterLine 220 and CenterLine 230BP manual guidance so appealing are now available in an assisted steering package that’s ready to make a difference in your operation. 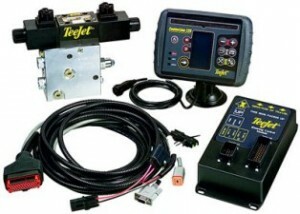 TeeJet FieldPilot connects to the hydraulic power steering system to provide reliable and convenient control. This method of connection keeps the cab free of brackets and motors that may interfere with normal steering. During operation, the first pass in a field is drive manually. Subsequent passes are conducted by lining up the vehicle near the desired swath and engaging assisted steering. The vehicle will automatically maintain its precise location on the desired track. At the row end, the operator can easily disengage the steering system and make the headland turn manually.